Congratulations to Elk Grove Unified School District for winning the 2017 Silver Green Cleaning Award for Schools & Universities in the K-12 category! This Sacramento County school district, the fifth largest in the state of California, is home to 67 schools and an approach to green cleaning that’s always getting better. It helps that the custodial department has a supportive, fully engaged community—and a staff that takes pride in their roles as protectors of student health. Almeida has been with Elk Grove for more than 20 years. Over the years, he’s watched the school’s custodial closets evolve from being jam-packed with 10 different scented chemicals, to centralized dilution centers with just one third party-certified hydrogen-peroxide based product. Today, engineered water technology has been implemented in more and more sites, all as a part of a continual process of eliminating VOCs from its schools. Currently, engineered water is the primary cleaning agent used at three elementary schools, with a goal of being used at all 42 district elementary schools before the end of the year. Then they’ll focus on middle schools and high schools. 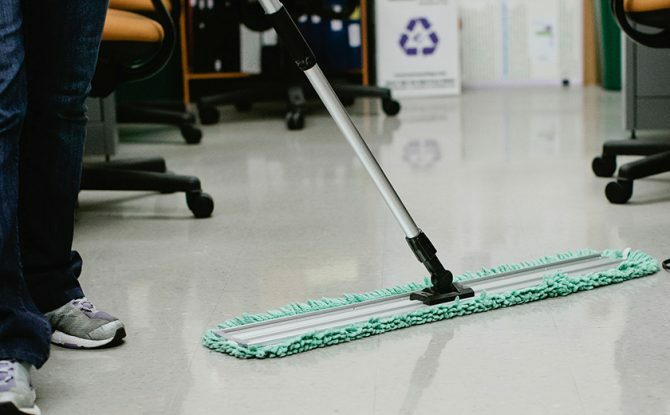 Almeida’s department benefits from a supportive and understanding administration and superintendent, who have bought into the benefits of green cleaning. Now, every new building that goes up in the district has an allotment for engineered water technology in its initial budget. One of the really unique ways that Elk Grove has been able to get engage the community in a green cleaning culture has been with its recycling program. Recycling is mandatory throughout the district, and students are actively engaged in the process. In fact, at one elementary school, Girls Scouts actually run the recycling! Once a week, the troop collects all recycling from classrooms and offices and brings them to the proper Dumpster prior to collection. Elk Grove is looking beyond products and equipment in the quest for healthier indoor environments and green custodial operations. New schools are built with rubber flooring that helps to eliminate some of the harsher floor care chemicals. In fact, Elk Grove has eliminated all floor stripping from its custodial operations. “We’ve been doing that for years, having no idea that people just started talking about eliminating stripping as a hot green cleaning trend,” says Almeida. The custodial team at Elk Grove uses a diamond pad and water on the floors. This has had a dramatic effect on the bottom line by eliminating the need for floor stripping chemicals and special PPE for the process, has improved indoor air quality by eliminating the harsh floor stripping chemicals and even eliminated floor-related slip and fall injuries last year. The small group approach to training has deepened the relationships Almeida and his supervisors have with their staff, developing more trust in the custodial teams. “Being an effective leader and supporting your folks out there is a huge part of our program,” says Almeida. The Green Cleaning Award for Schools & Universities is the only award dedicated solely to recognizing schools and their facility leaders for the tireless work of promoting clean, healthy and sustainable school buildings. Presented by Healthy Schools Campaign, American School & University magazine and the Green Cleaning Network, it highlights schools with innovative, health-focused and environmentally minded cleaning programs. Judging criteria are based on our 5 Steps to Green Cleaning in Schools. Applications for the next round of awards will be available soon. Sign up to be notified when the application is posted. For more information check out the American School & University website. We look forward to learning about your green cleaning program!